You’ve picked up a new Betta fish and put him in a great Betta tank. You bought a good filter and added an affordable heater. Now it’s time you decked out your tank. Betta’s like to swim, and they like to have places to hide and hang out. Adding some cool Betta fish tank accessories can be a great way to make your Betta’s home more interesting to look at and more fun for your Betta to live in and explore. From fun decorations, to perches, to lights and hiding places, here are 12 of the latest Betta fish tank accessories that will liven up any environment. Every Betta tank should have some of these. 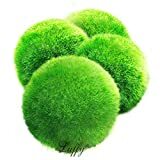 Made of marimo moss, Luffy’s Betta Balls are live plants that not only add a splash of color and fun to your Betta’s habitat – they also help keep it clean. Marimo moss absorbs many of the same nutrients as algae, so they will help keep your tank algae-free. Plus, your Betta will love to push them around and play with them. 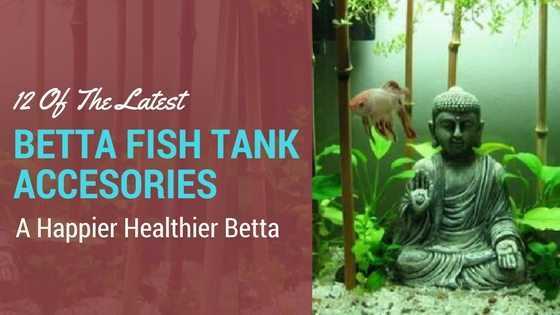 Want to learn more about the benefits of Betta Balls and other popular plants for your Betta tank. Read: The Best Live Plants For Betta Fish That Are Super Easy To Keep. Your Betta will absolutely love lounging on this leaf-shaped Betta Hammock from Zoo Med Laboratories. Attached to the side of the tank with the included suction cup, the Betta Hammock provides a nice platform for Bettas to rest and hang out. You might find that you’ll have trouble getting your Betta to do anything else! Do you want your Betta aquarium to look like it’s filled with sunken treasure? This Aquarium Vase Betta tank accessory looks like a long-forgotten artifact at the bottom of the ocean. Holes on either end allow your Betta to swim through it and explore. This tank decoration looks great and provides space for your Betta to enjoy. This LED Aquarium light bar from Mingdak has some unique features that make it stand out. It’s fully submersible, so you can have lighting inside your tank. With solid aluminum construction, it’s also very durable. And it features a quick-disconnect between the cord and the light itself, so you don’t have to disturb your electrical plug setup for cleaning. If you’re looking for a light for your aquarium, this one is a no-brainer. 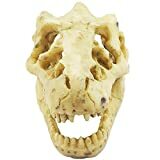 This resin dinosaur head tank decoration from Bestgoo lets you add a touch of Jurassic Park to your Betta’s tank. This awesome Betta tank accessory is nontoxic and durable, and also gives your Betta somewhere to hide. Have fun with your aquascaping with this unique item. Bettas enjoy having places to hide and explore, and these Hideaway Pipes from Penn Plax give them that. The three tubes are connected in the middle, so your Betta can have fun swimming in and out of the different entrances. 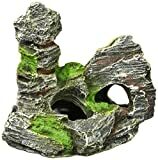 The natural look and moss effect also looks great and adds a touch of nature to your tank. This large aquarium decoration lets you add an underwater mountain to your aquascape. Made of resin, this unique accessory looks like it has barnacles and other underwater life growing on it. Your Betta will love swimming in and out of the several holes, and the inside makes a great place to hide. 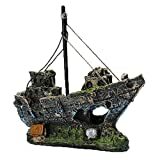 This attractive resin pirate ship is a great way to add a splash of fun to any tank. Throw this in your Betta’s home, and he’ll look like a whale swimming around a sunken ship. There are also several access holes and tunnels for your Betta to explore, or just hang out and rest. This is an all around great Betta fish tank accessory. This awesome tank decoration is made of soft silicone, so the tendril of the artificial sea anemone will move with the water flow. 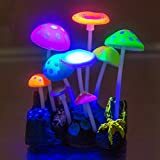 This decoration is also phosphorescent, so hitting it with blue or white LED lighting will add a unique glow effect to you tank. This decoration is eye-catching, and your Betta will enjoy swimming through the tendrils. This bamboo Betta tank ornament from Marina can work with many different aquascaping concepts, from peaceful zen garden to dark forest. The bamboo shoots also create a fun playground that your Betta will love swimming around. This tank decoration will make any tank look good, and your Betta will enjoy them too! This whimsical decoration can add a splash of fun to any Betta tank. 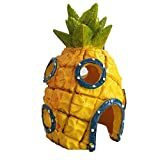 The pineapple shape a bright colors are unique and entertaining, and this tank accessory provides a great shelter for your Betta to explore and hide. If you like your aquascapes to be a little quirky, this decoration will fit right in. No matter your style or the kind of aquascape you’re going for, you should be able to find a decoration on this list to fit your vision. And as a bonus, these great tank accessories add a lot of benefits to your Betta, like giving him a place to explore, hide, or perch. Adding some of these accessories to your Betta’s home will give you a great looking tank and a happy Betta.